Flexible ADSR envelope with voltage control of decay and release times. Interesting hold and repeat functions turn the envelope into a LFO with gating functions. Classic ADSR type envelope generator. Decay and release times can be voltage controlled via a common input for positive CVs between 0 and 10V. Time ranges of the segments: Attack: 0,5mS to 10S; Decay: 2,5mS to 20S; Release: 2,5mS to 20S. - STD/STD: Normal ADSR mode. A gate triggers and holds the envelope up to the release phase. - HOLD/STD: hold will hold the envelope at sustain level. Signals in the gate input have no effect. A signal at the Trig/Retrig-In restarts the AD phase and keeps the envelope at sustain level until the next trigger. - ONESHOT/STD: Press the swithc into oneshot position and you´ll fire the envelope once. trigger signals at the Trig-Retrig-In will restart th envelope only when oneshot switch is pressed. - HOLD / GATED REPEAT and HOLD / AUTO REPEAT have the same effect. 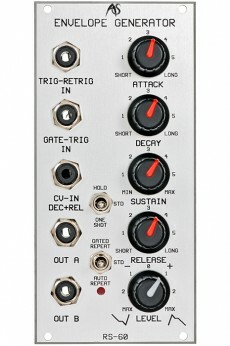 Attack and decay phases will be repeated and the module acts as a LFO. Rate is dependent on the A/D times and range from 0.003Hz to 300Hz. A gate at the Trig-Retrig-In holds the signal at 10V, without gate the LFO continues cycling. 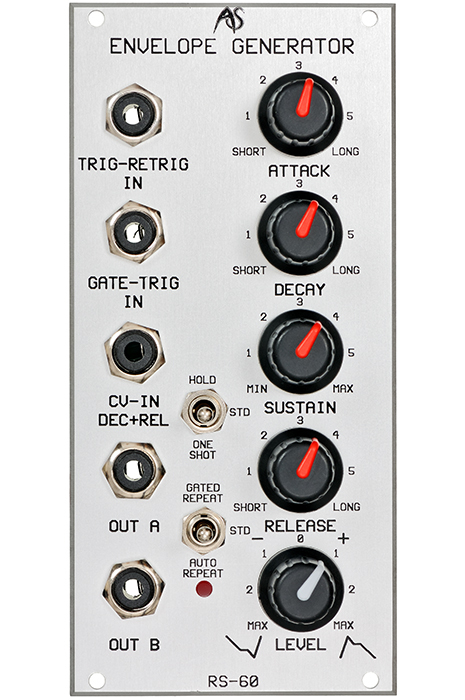 - STD / AUTO REPEAT: A gate at the Trig-Retrig-In holds the signal at 10V, without gate the LFO continues cycling. - ONE SHOT / GATED REPEAT and ONE SHOT / AUTO REPEAT have the same effect. The oneshot switch generates a gate and fires the envelope. A gate at the Gate-Trig-in will hold the envelope at 10V, without gate the envelope will be looped. The envelope signal is present at two outputs A and B and it´s level can be controlled and inverted with a potentiometer.